Successful brands have always found influencers and celebrities helpful in selling their product. Sometimes brands embed messages hoping to ride the waves of cultural change all the way to the bank. But when the winds change suddenly, how a brand navigates the wave impacts its survival. Chicago Booth Alumni Club’s Strategy Management Practices Issues Group (SMPIG) lively discussion in February took up this topic. Using a few curated articles about L’Oréal and its recent controversy (list at the bottom of the post), the focused conversation increased awareness and generated a series of leadership tips. Marketing science professor Byron Sharp, in How Brands Grow (2010) found that brands which align themselves to people’s special interests may strengthen loyalty but do not gain more buyers. American Marketing Association 2015 data supported Sharp’s research. Growth occurred in only 47% of the 200 fast-moving consumer goods (FMCG) categories tracked by the Kantar World Panel in 39 countries—representing 76% of global GDP. Within that minority, 79% grew because they gained buyers. Among the declining brands, 84% fell because they lost shoppers. Cross-cultural success delivers growth, but it proves difficult to strike the right chord, as evident by stories in which well-intentioned international brands have found themselves under the spotlight. Any time people connect, it’s impossible to escape the reality of politics. The spirit of inclusiveness continues to find new form and embed itself into structures that once bounded cultures and separated people whose beliefs, attitudes and behaviors made them different. Today, individual differences are celebrated and personal expressions transcend old barriers that preserved collective differences at work, within and across communities, in schools and at home. Look no further than the increasing love affair with the Avocado. Once a rare treat, the Avocado has gone mainstream, a reality made possible by the opening of public attitudes and legal restrictions around immigration and trade. The popularity of the Avocado over time serves as an exemplary parallel. The fruit first appeared as an ornamental in North American in the 1830s. Limited immigration from South and Central America centered on fruit growing regions in Florida and California introduced edible varieties, which by 1930 made it the aristocrat of salad to eaters in the know. In 1965, the passage of the Immigration and Naturalization Act brought a surge of Latin American immigrants and their deep love for avocados spread to other regions. Similarly, the opening of free trade agreements with South/Central America and Mexico now makes it possible for everyone to enjoy the Avocado. In N. America, annual average consumption is up to 7 pounds. The Hass avocado is both a great brand success, and an example of how larger realities are blurring once distinct lines that separated political issues and business performance practices. A politic or political strategy? Politic, is not just a noun. When used as an adjective, it describes prudence, something having practical wisdom. It is also expedient, such as a plan that modifies and shapes conversation. This intentional language, behavior and attitudes express only what people feel comfortable sharing on an exclusive basis among present company. Think of it as a test for emotional intelligence in action. In 2018, politics–the noun, crops up everywhere. Few conversations or experiences remain exclusive. Nothing remains immune from factional charges seeking greater influence in governmental affairs, and in changing wider public attitudes and actions. The conception and use of brand as means to distinguish a product and/or company dates back to the ancient Egyptians who were known to have engaged in livestock branding as early as 2,700 BC. The tangible, symbolic representation of brand differences work on a conceptual level too; and that’s why shaping perceptions remains a strategic imperative for marketers. Marketing strategies designed to produce higher growth and revenue depends on their success engineering positive responses. The practices and methods apply specific scientific approaches to choose language and imagery that appeals to their buyers, and increase the brand’s attractiveness to the wider public. The geographic and generational breadth, speed and low cost frequency in which communications and messages spread in 2018 correspond to the deterioration of privacy and privilege. These effects and consequences apply to companies, their CEOS, their boards, and their cultures, which all face higher scrutiny fueled by their own communications designed to grow collective expectations. In other words, some brands managed to step into the mess of their own making. Other brands chose passivity and neutrality expected the approach would spare them from downside effects of wider change in public sentiment, attitudes and sensibilities. In 2010, Target discovered the downside of transparency, when its donation to an anti-gay political action campaign set off culture wars and boycotts. Missing this lesson, Chick-Fil-A CEO Dan Cathy grabbed national news headlines in 2012, when he took a public stance against Gay marriage. Numerous brands, regardless of their size, geography, industry or culture find themselves in uncomfortable positions following actions that in previous eras would have never remained in the public eye for long. The more successful a firm brands its products, and communications from the CEO remain consistent, it becomes impossible to separate the actions and statements of individuals’ personal views and behavior from the firm and its brand. This applies to CEOs as well as employees. Who decides what’s ok for who, and does the situation, or the location matter? Following the 2017 US Presidential Inauguration, an atmosphere of hyper political correctness seems to have taken hold of the public consciousness, not just in the US but globally too. Traditional news and social media reports reveal the extent of this open grab for the nation’s moral compass and associated fight to steer the nation’s attitudes, policies, local and global image. CEOs similarly find themselves pondering their responsibilities as both brand ambassador and revenue growth leader. For a founder, the cultural tone and values of the firm tend to align naturally. Best when this occurs intentionally rather than as an afterthought, or footnote. What about hired or successor CEOs, should the board and/or new CEO consider alignment of personal values, politics with those of the firm a necessity? The politically charged atmosphere and volatility of public sentiment may be a more recent consideration, but so too are the growing demands around transparency and consistency of management decisions across business functions as they consider issues ranging from diversity, personal rights, tolerance for differences, the environment and social impact issues. Neutrality no longer an option? In 2016, Fortune magazine questioned Apple’s politics as harmful to its brand. Put another way, expectations rise in step with your product’s prominence and success. Do they also create a reason or expectation for the firm to step up and speak out? Steve Jobs may have been reticent when it came to politics, but then he led in an era that was considerably less connected, public opinion around social issues more stable and corporate business scrutinized under the narrow lens of shareholder returns. Hiring practices, corporate benefits and environmental concerns are now very much in the spotlight thanks to changes in government regulations nationally and internationally that set new accountability standards. Lobbying presence to secure special immigration privileges for their work force, suddenly found themselves caught up in the broader unsettled issue on illegal immigrants. Yes, your actions once you begin to take them always open the door and give license to other actors who build on those actions. Its folly to believe that your strategic plans or tactical plans can ignore politics of the emotional intelligence or public faction variety. The NFL continues to find its viewership declining, perhaps a bit more steeply than the steady fall off that resulted from over saturation and exposure to a shrinking television audience. What happened in this past season however shows the poor judgment of its leaders to think through the consequences of actions undertaken several seasons back. Politics are not a new feature of Sporting events, historically they all begin with the national anthem. The additional tributes to veterans and subsequent requirement that players appear on the field opened the door and made it easier for individual players to make statements of their own choosing. Whether this means changing personal appearance- hair, visible tattoos—or public displays of affection, social/civic endorsements or politics. The absence of a microphone didn’t dim the spotlight and allowed them a more creative means of expression that they considered respectful, but raised considerable debate and put the brand in the uncomfortable position at the heart of the controversy. International brands constantly struggle to resolve the inherent tension between local attitudes, resources and cultural norms and the cost benefits available by greater integration at the global level. It’s easy to get the balance wrong, especially as local conditions and authorities predetermine standards and needs. The French cosmetics giant L’Oréal seems to defy the odds with a portfolio of brands from many cultures to become the uncontested world leader in skincare, makeup, hair color and a close 2nd to P&G in hair care worldwide. Key to their standing and success is multicultural mastery, at least that was the conclusion by Hae-Jung Hong and Yves Doz who shared their assessment in HBR, June 2013. L’Oréal business challenges are not atypical for a global portfolio of internationally known brands. Their management approach and success is exceedingly mindful. As successful symbols of fashion and sophistication, the brand must simultaneously appeal to the idealized self-image of customers and remain responsive to local tastes without undermining the global image. Their solution was to overcome their local mentality and sensibilities by hiring executives from mixed cultural backgrounds to fill over a third of L’Oréal’s product development teams. These lifelong experiences navigating cultural complexities give them a leg up into senior management roles where their cross-cultural communications and adaptation skills prove invaluable. The choice to hire Amena Kahn, was an intentional outreach effort and demonstration of inclusiveness to the Muslim world and initially met with great acclaim. That is, until revelations that their new hijab wearing Beauty ambassador had posted Anti-Semitic statements in social media in 2014. Management acted swiftly to manage the risk with efficiency. They quickly moved to replace her and apologize to an array of concerned constituents across multiple channels. 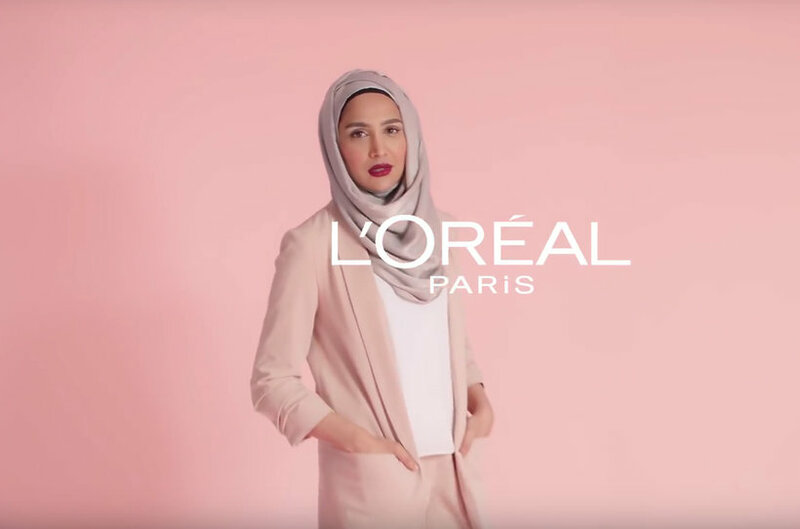 In short, L’Oréal was prepared and aware that their willingness to push into the politically charged social issues comes with considerable risks, which they seem to manage with great deftness. L’Oréal proves the adage that rewards only come to risk takers, the trick is they are better prepared for the messiness of cross cultural battle. Knowing your strengths and capabilities are key pillars to your strategy. Can’t be all things to all people, at the very least you need to be authentic to be true. Know that you will make mistakes and prepare the multi-layered responses. Before moving forward, recognize that there’s always a chance your marketing may offend people. Assess the benefits in light of these costs. All brands have strategies, the question to ask is how they connect to the wider business strategy and proceed accordingly. When dealing with politics, whether internal or external, the approach must be intentional, neutrality better than passivity. Think what the enemy or counter charges might do to harm your brand. ← Is your strategy impeding or promoting adaptive change?